Totally love the quilt! And great photos again, too. Ich finde die Farbkombination hervorragend. Vor allem, da es gedeckte Farben sind. Ein schöner, solider Quilt ist das geworden. Like the colour progression! Unusual but very effective. Really nice quilts for baby boys are not always easy to come by… trust me I know with my two little guys. Even though the design is very simple, it packs a powerful punch… I love the color combo on this one! I completely agree, Allison. And when I make a quilt it usually includes either hot pink or some kind of flower print variation, which is a shame, because there are a million possibilities​ when it comes to fabrics. I plan to make another baby boy quilt this month. Let’s see what else I can come up with! Gray and green look great together…grey is a very versatile colour. It looks great with lots of other colours. Lovely baby quilt! Perfection! While we may not ever pick a color combination ourself, it’s fun to see it come together and especially fun to see that the combination isn’t bad at all! Your pictures are gorgeous too! Gorgeous! It is a perfect baby boy quilt! Such a lovely baby quilt! Love the great transition from gray to green. TFS! Heide, thank you for your lovely comment! Love the greens to grey color scheme! They work lovely together! Dawn, thank you! They work surprisingly well, don’t they? Great job ! Unusual palette but that works very well. I really like the fabrics you choose for this project, they are working together wery well. Such lovely colors! I always have a hard time designing knock-out quilts for boys, but you really hit this one out of the park! Yeah, I wouldn’t of thought grey and green would work either, but that’s pretty cool! I’m still in awe that it worked out so well with these colour restrictions. Nam, thank you so much for stopping by! I simply love everything about this little quilt. I need to add more greens to my quilting fabric palette. Thanks for sharing with us on TGIFF. I totally stumbled upon this blog/site. It was listed as the top one on my wordpress main page when I log in. As someone that writes a theology/volunteering blog it is kind of outside my realm but wow are these ever some beautiful pieces of work! Really enjoyed seeing your work and browsing through your site/blog. Also seems you have a great community here! Thank you for your lovely and thoughtful comment. I write this blog to not only share my own projects but also to showcase that quilting can be so much more than your grandmother’s pasttime hobby. I’m so happy you stopped by! Hi Vicki, what true words you write! The quilt looks very elegant and it is great to snoop outside ones comfort zone. Please add the Modern patch Monday link to your links as I am missing it at the moment. Hey Iris, will add it in an instant. I linked up on my phone in bed this morning, so I didn’t have a chance to add it then and there. Thank you for your lovely comment! Thank you so much for stopping by my site and leaving this lovely comment. This color combination is spot on. 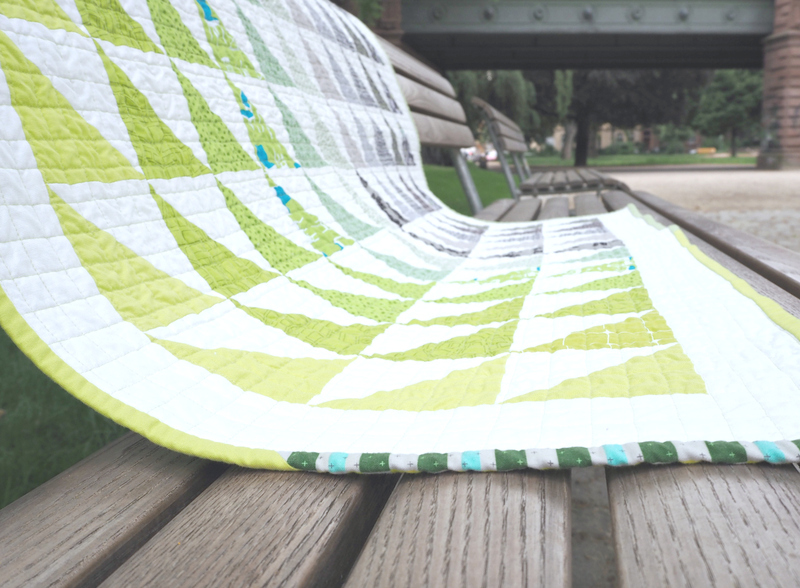 The quilt is gorgeous–an excellent example of how colors work together to form an overall relationship. Looking forward to seeing more. Hey Roberta, thank you for taking the time to leave this wonderful comment. I totally agree, colour placement has such a huge impact on the overall perceipton! Cynthia, thank you so much for your lovely comment. I love the design and color scheme!! So lovely! Acuh wenn ich für Grün im Regelfall selten eine Verwendung habe, so bin ich einfach nur hingerissen, wie du die Farben kombiniert hast und das Grau das Grün nicht zu bunt und laut werden lässt. Toll! Danke für deinen so lieben Kommentar bei mir, ich habe mich sehr über deine Worte gefreut. Liebe Judith, danke auch für deinen netten Kommentar. Grau und Grün hat hier viele überrascht inklusive mir! Such a gorgeous quilt!!! I love ombre effect in such a soothing color palette. Beautiful work!! Love this quilt. The grey and green fabrics you chose, go together perfectly. So cute!! I would love to be able to make such cute quilts! This is a beautiful quilt… So serene. The color combination is incredible. I started quilting in 2015 and I’m hooked! You’re so right! I never would have! combined these colors – but they are so beautiful! Great job! I love the play of shapes between your piecing and quilting – triangles and squares! Absolutely stunning! Thank you for sharing! Patricia, thank you so much for your lovely quilt! I guess the grid quilting is really effective since the Patchwork pattern is repetitive, too. I use These simple straight lines a lot and they rarely disappoint. What a lovely quilt. It could so easily be done in a variety of color schemes. Love those last two pics featuring the quilting! So beautiful! Thank you for sharing at Sew Cute Tuesday! ​Thank you so much Hilary. And huge congratulations on the birth of your adorable sun. Your announcement made for the cutest sew cute tuesday =)​ Hope you and little man are doing fine. Simply splendid color choice! So sophisticated for a baby. Children need the handmade, the unexpected — it opens their minds to possibility. This quilt does just that! That’s beautiful! I too love the colors🙂 You are quite talented.